Your standard Post-it note is a one-sided, single-use affair. You're free to flip it over and write on the back, of course, but then you can't actually stick it anywhere. The folks at EcoStatic Inc. figured they could do better, and they have, with a sticky note that relies on static electricity instead of adhesive to cling to flat surfaces—and one side is even erasable. 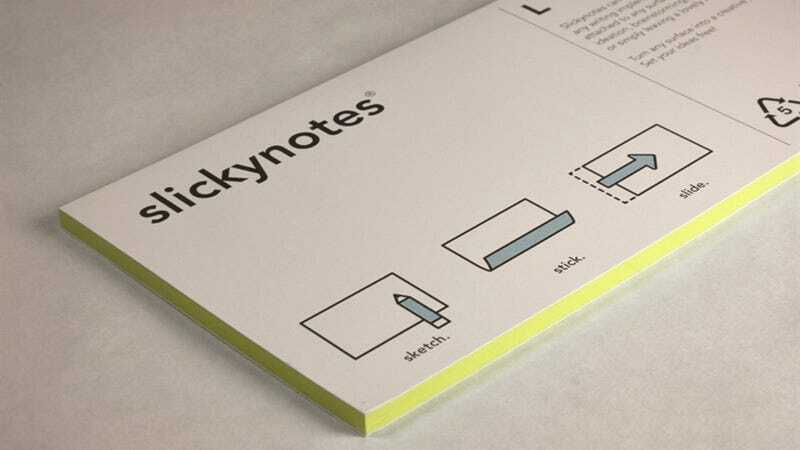 The tinted side of the Slickynotes works just like your standard paper sticky note, letting you jot a message in pen or pencil. But it's the other side where the real magic happens. It's covered in a material similar to what's used on whiteboards, and that's what gives the Slickynotes their electrostatic cling for weeks on end.